At this time of year our gardens are usually producing an abundance of delicious rhubarb. We had a very wet spring in southern Ontario so my rhubarb is growing so prolifically that I have more of the stuff than I could eat all summer long. 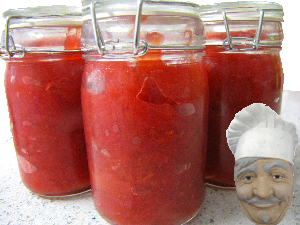 So, I decided to make some rhubarb jam; here is how I did it. Cut the rhubarb stems into pieces about an inch long then wash well. You will need about 4 cups. Add sugar, the amount is not critical but about 1 cup for every 4 cups of rhubarb is a good guide. In May and June rhubarb is less tart but add more sugar in making this recipe in late season. This recipe is very simple to make and the resulting jam (I guess you could call it "rhubarb jelly") is absolutely delicious!